The American Legislative Exchange Council has always been secretive, but now officials are moving to prevent open-records requests for information about the group’s influence. In the two years since the ALEC Exposed project revealed the role that the secretive American Legislative Exchange Council plays in shaping the laws of states across the nation, the group has had a much harder time hiding its meddling. In fact, so much national attention has been paid to ALEC’s role in promoting restrictive voter ID laws and controversial Stand Your Ground initiatives that ALEC officials announced last year that they would shut down the task force that was responsible for promoting those measures. But ALEC is still putting representatives of corporations together with state legislators to craft “model legislation”—especially with regard to economic and regulatory issues. And the group’s national treasurer has come up with a novel scheme for keeping the projects secret. The Wisconsin Republican says she is exempt from open-records laws, and her state’s Republican attorney general says that’s cool with him. Wisconsin State Senator Leah Vukmir, a key confidante of Governor Scott Walker who serves as ALEC’s national treasurer, has for months been stonewalling a legitimate open-records request from the Madison-based Center for Media and Democracy (CMD), which worked with The Nation on the 2011 ALEC Exposed project that revealed how the corporate-funded council has been working with state legislators across the country to enact measures developed by special interest groups. As Vukmir has emerged as one of the most prominent figures in ALEC, the Center for Media and Democracy has sought information regarding bills she has proposed in cooperation with the national group. Because of her refusal to cooperate with those requests, CMD is suing to force her to turn over the records. Vukmir is not the first legislator to try to thwart the public’s right to know. 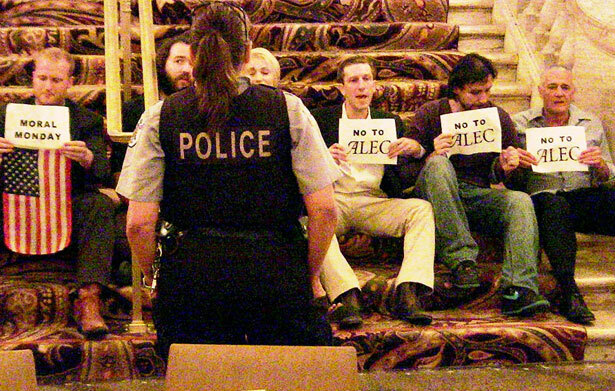 Just last year, CMD had to sue a group of Wisconsin Republican legislators to get them to turn over ALEC-related documents under the open-records law. But Vukmir has taken things to a new, and bizarre, level. She’s claiming that a constitutional protection against targeting legislators with nuisance lawsuits exempts her from following the open-records laws that was established by the legislator—and that legislators, state officials and the courts have respected for decades. She’s serious about this, as is her staff. When a process server went to her office to deliver paperwork regarding the lawsuit, one of Vukmir’s top aides was—according to a document filed in regard to the case—verbally abusive, physically aggressive and threatening. When another process server went to the office, the abuse continued. Vukmir—with support from Republican Attorney General JB Van Hollen—is advancing an interpretation of the open-records law that claims members of the Legislature do not have to obey the rules when the state Assembly and Senate are in session. Since the Legislature is, for all intents and purposes, permanently in session, Van Hollen is effectively arguing that the open-records law should no longer apply in any meaningful way to the Legislature. This is radical stance that raises a big question. Brendan Fischer, a CMD lawyer, asks: Why are they willing to try to torpedo the open-records law to keep Vukmir from having to defend her position? The answers that suggest themselves are these. First, since Walker (an ALEC alumni) and his allies took charge in 2011, Wisconsin has seen a steady importation of proposals regarding unions, public education and a host of other issues. Instead of thinking for themselves, Walker and legislators like Vukmir seek to implement a national agenda shaped by corporate campaign donors and groups like ALEC. This is no secret. It’s been widely reported that Vukmir and other top legislative allies of the governor regularly fly off to ALEC conferences with corporate titans. But specfic revelations regarding Vukmir’s involvement, particularly with regard to the crafting of legislation, could provide citizens with a clearer picture of who is pulling the strings. And that is a detail that the senator and the attorney general appear to be determined to keep hidden. Second, and perhaps even more importantly, under Walker and a number of the hyperpartisan Republican governors elected in 2012, traditional models of responding to the great mass of citizens have been abandoned. The operating premise coming from these governors is one of: You’re either with us or you’re against us. Van Hollen, as a Wisconsin constitutional officer, should be with the people. Unfortunately, in this case he has chosen partisanship— like Vukmir, he’s an active Republican— over the rule of law. And the public interest. Why? What is so vital about keeping ALEC details secret? Yet, in Vukmir’s case, Van Hollen’s lawyers are attacking the very same open-records law. It is always unsettling when law enforcement officials enforce one set of rules for their allies, and another for their opponents. It is even more unsettling when this is done to prevent citizens from knowing what a state is doing in their name, and with their tax dollars, but without their informed consent. If legislators in Wisconsin, or any other state, do not have to abide by the open-records laws they enact, then “the public’s right to know” is a slogan—not a reality.